The dosage of UltraClear SST is based on the volume of water in pond. Generally, use 1 ounce for every 150 gallons of pond water. The required frequency of product dosing will vary between once per week to once per month in most cases. If you are simply trying to prevent a problem that seems to occur each year, start dosing UltraClear SST before you have a problem, and repeat once a month during those months when you have normally experienced blooms.or growth in your pond. If you are treating an existing problem, dose once a week until the problem is solved, then revert to dosing monthly or as needed. For severe problems, dose daily until the pond shows improvement. That will mean that you observe a brownish look associated with decay. At this time, switch to once a week dosing. Then continue until the problem is solved, at which time you may revert to the standard monthly doses, or as needed. You cannot harm your pond by overdosing. But remember that all biological solutions take more time to show results than would chemical techniques. By following the above dosage guidelines, you will achieve the best mix of rapid results without wasting product. 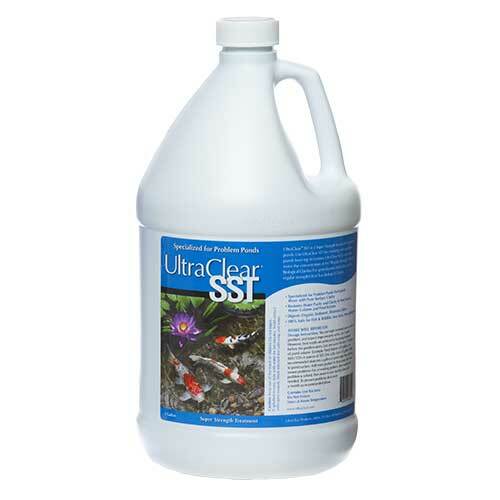 For best results, mix the required dose of UltraClear SST into a gallon of pond water, shake or mix well, then distribute the mixture around the pond. Put most of the product in the areas where you have a problem. Apply greater amounts of the product directly to areas where the problem in the worst.